Book retailer Barnes & Noble expects to generate $1 billion in revenue from sales of digital books, including e-books and e-textbooks, by 2013, the company said on Thursday. The company hopes to capture a 25 percent share in the e-book market by then, said William Lynch, B&N's CEO, in a letter to shareholders detailing the company’s business growth strategy. Revenue from B&N’s digital division, B&N.com, totaled $144 million in the first quarter of 2011, according to a filing with the U.S. Securities and Exchange Commission on Sept. 9. The division accounts for e-commerce, device and digital newsstand sales. The company reported $1.4 billion in revenue for the quarter. 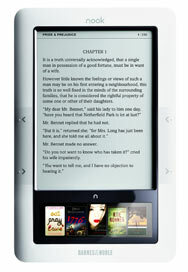 B&N sells the Nook e-reader, which was announced in October 2009. The company has said that its digital strategy includes delivering books, magazines and newspapers not only to the Nook, but to multiple devices. The company earlier this year released Nook mobile applications for Google’s Android OS and Apple’s iOS, which is used in the iPhone. Sales of e-books have been the primary driver of revenue growth in the digital business, Lynch said. Strong Nook sales and the company’s 717 physical stores have helped fuel healthy e-book sales. “We’ve gone from zero share to capturing over 20 percent of the digital trade book market—a higher share than the 18 percent we possess of the physical book market,” Lynch said. The exploding digital reading market is also affecting retailers that have book departments. “As the physical book market contracts over the next four years, from approximately $21 billion to $19 billion ... we see many of these non-book retailers de-emphasizing the book category with greatly reduced shelf space and in some cases eliminating it all together,” Lynch said. “It’s clear there will be fewer bookstores in this country and as we continue to maintain the best real-estate portfolio of locations and best run retail bookstore model, our stores will be the beneficiary of this consolidation,” Lynch said. Online retailer Amazon.com has also found that e-book sales are outpacing hardcover book sales. Amazon sold 143 Kindle books for every 100 hardcover books during the previous three-month period, it said in July.